Contents: Introduction, Paul Carr; Zappa and horror: screamin’ at the monster, Richard J. 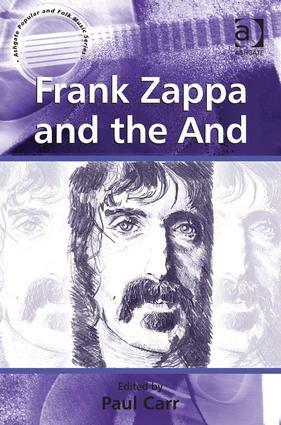 Hand; Zappa and his cultural legacy: authorship, influences and expressive features in Frank Zappa’s movies, Manuel de la Fuente; Zappa and religion: music is the best, Kevin Seal; Zappa and the razor: editing, sampling and musique concrète, James Gardner; Zappa and satire: from conceptual absurdism to the perversity of politics, Nick Awde; Zappa and resistance: the pleasure principle, Claude Chastagner; Zappa and the story-song: a rage of cultural influences, Geoffrey I. Wills; Zappa and technology: his incorporation of time, space and place in performing, composing and arranging music, Paul Carr; Zappa and the freaks: recording Wild Man Fischer, David Sanjek; Zappa and modernism: an extended study of 'Brown Shoes Don’t Make It', Martin Knakkergaard; Zappa and the avant-garde: artifice/absorption/expression, Michel Delville; Zappa and mortality: the mediation of Zappa’s death, Paula Hearsum; Bibliography; Index. Paul Carr is Head of the Division of Music and Sound and Reader in Popular Music Analysis at the ATRiuM, University of Glamorgan, in Cardiff. His research interests focus on the areas of musicology, widening access, the music industry and pedagogical frameworks for music related education - publishing in all of these areas. Publications include ’An analysis of post 1970’s electric guitarists who have fused the jazz aesthetic with other music forms’ (Book chapter in De-Canonizing Music History, 2009), ’Researching the Development of a Foundation Degree in Musical Instrument Retail Management: A Case Study Partnership between Glamorgan University and Roland UK’ (Journal of Applied Research in Higher Education, 2010) and ’An Autocratic Approach to Music Copyright? : The potential negative impacts of restrictive rights on a composer's legacy: The case of the Zappa Family Trust’ (Contemporary Theatre Review, 2011). He is also an experienced performing musician, having toured and recorded with artists as diverse as The James Taylor Quartet and former Miles Davis saxophonist Bob Berg.